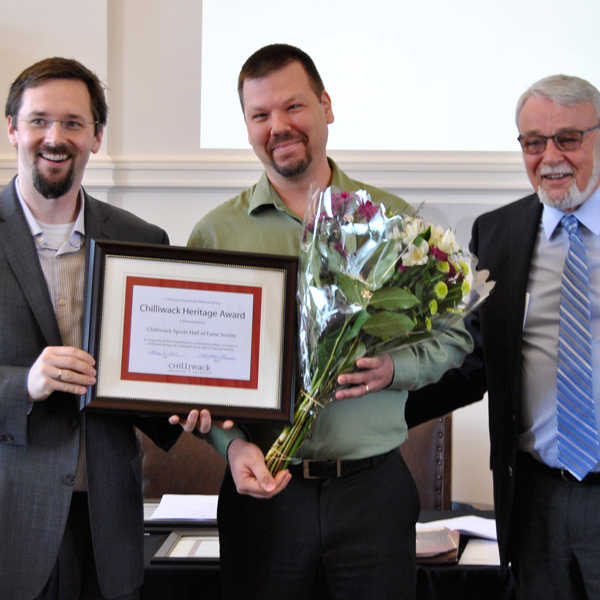 Matthew Francis, Executive Director and Fred Feistman, President, present Eric Welsh of the Chilliwack Sports Hall of Fame with a Heritage Award, 2015. Black Press Media/ Chilliwack Progress – for their participation in the digitization project that saw 100 years of the Chilliwack Progress Newspaper made available for online searching. Chilliwack Sports Hall of Fame Society – for their work in celebrating, promoting and preserving legacies of sporting excellence in our community. The Poppy Project: Dr. Molly Ungar and Pierce Smith – for their interactive Google map, which shows home addresses of people from Chilliwack listed on the Chilliwack War Memorial who died in World War I and II. Linda Phelps – for her mounting of over 35 local art exhibits as part of the Chambers Gallery Art Program. Linda Phelps – for the Heritage designation of her home, the Gervan House. Rob O’Brennan and Gwyneth Jones – for the Heritage designation of their home, “Stonehurst”. St. Thomas Anglican Church – for their publication: St. Thomas Anglican Church 1873 – 2013. Ron Denman – for his career long contributions to many local history publications including the Chilliwack Historical Society’s most recent book: Memories of Sardis. Ron Denman also received an Honourary Life Membership to the Chilliwack Museum and Historical Society for his long service as Director of the Chilliwack Museum and Archives. Bea Mazurenko, Eleanore Reid, Diane Warner, Dayln Sexsmith and Mary McGhee for installing a heritage plaque at Ryder Lake. Dave Parsons, superintendent of civic facilities, City of Chilliwack – for his career long work caring and maintaining two listed heritage buildings for the City of Chilliwack – the Old City Hall (museum) and the Princess Street Armories. Rod Hudson, retired director of the Chilliwack Community Arts Council – for being the driving force behind a number of cultural events in Chilliwack over his 20+ year career, including the Chilliwack Bluegrass Festival. Robin Anderson and Scott Sheffield from the University of the Fraser Valley history department – for the development of their course: “440: Local History for the Web” which saw students undertaking research at local archives and publishing historical information on the web. Author Dr.Chad Reimer for his book Chilliwack’s Chinatowns, published by the Chinese Canadian Historical Society of BC and UBC. Authors Andrea, Sheila and Robin Lister for their book Commitment to Caring: 100 Years of the Chilliwack Hospital Auxiliary. Authors Tom Beer, Bill Chambers, Wayne Green, researcher Grant Ullyot, and current fire chief Rick Ryall for their book Chilliwack Fire Department 1906-2006: The First 100. Anna Erho for long time commitment to the Chilliwack Museum board of directors. Sto:lo Nation staff for their new building housing the Research and Resource Management Centre. Pat Todd for her donation of Sxwo:yxwey maskes carved by Simon Charlie to the Chilliwack Museum and Archives. Norman Williams for his donation of cameras and photographs to the Chilliwack Musuem and Archives. Ryder Lake Women’s Institute and volunteers for preserving the 100 year old Bill Voight log cabin. Author Bea Mazurenko and the Ryder Lake History Committee for their book Ryder Lake, The Place, The People. Artist Bonnie Graham-Krulicki for her work as an artist who preserves words from the Halkomelem language in a unique way. Artist Brian Croft for his work on Chilliwack, 1910 acrylic painting depicting the BCER station and downtown Chilliwack area with historical accuracy. The Chilliwack Times Newspaper for their book: CFB Chilliwack: A Photo Retrospective. Author Margaret Ballam for her book: Fairfields: A History of Fairfield Island. Author K.J. Watt for her book High Water: Living with the Fraser Floods. The Chilliwack Hospice Society for refirbishing the Kipp House on Hodgins Avenue. John Weaver for his bronze sculpture of Piper James Cleland Richardson located on the Museum grounds.